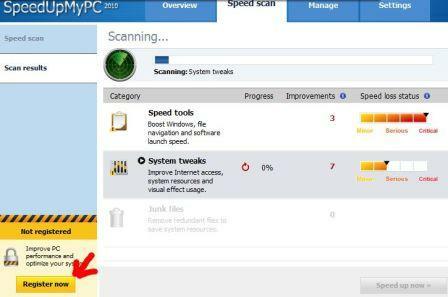 Uniblue SpeedUpMyPC 2010 (v4.2.1), from Uniblue Systems Ltd, is a latest version of an award-winning SpeedUpMyPC software, which is designed to scan your computer system for identifying the processes, files and settings that slowing your computer performance. Then, the application will provide a list of recommended improvements that need to be implemented for a faster PC, just as what its name implied – Speed Up My PC. Uniblue SpeedUpMyPC 2010 (aff) normally costs for $39.95. 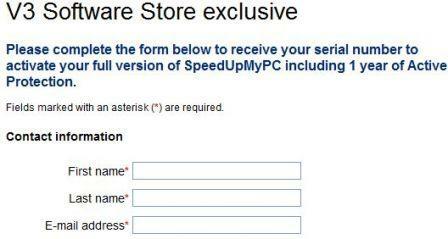 As part of Uniblue / V3 Software Store promotion, interested users now can download the Uniblue SpeedUpMyPC 2010 for free! This promotion will expire on 9am (GMT) April 5, 2010. So, hurry up! Visit promotion page at http://store.v3.co.uk/?act=details&id=4704. Press the Download button on store.v3.co.uk to continue to the setup installer of Uniblue SpeedUpMyPC 2010. Note: You must be a member of V3 Software Store to joint this promotion. Visit http://mag.uniblue.com/stores/sp/signup/, and complete the registration form to receive your free license code of Uniblue SpeedUpMyPC 2010. Note: The free license serial key (3-PC / 1-Year license) for Uniblue SpeedUpMyPC 2010 is only works with SpeedUpMy PC 2010 build from the V3 Software Store. After installation complete, click Register Now button to input your received license key for a full version of Uniblue SpeedUpMyPC 2010. Uniblue SpeedUpMyPC 2010 is fully compatible with both 32 and 64-bit versions of Windows XP, Vista and Windows 7 operating systems.